Situated in north-western Italy, Liguria (also known as the Italian Riviera), is one of Italy’s smallest regions. The region is largely split in two by the capital city of Genoa: to the east of the city, the Riviera di Levante has a fairly rugged, craggy feel while to the west, the Riviera di Ponente has wide beaches and lush landscapes. The coast around San Remo in the far west is known as the Riviera dei Fiori thanks to its mild climate which ensures that flowers bloom almost all year round. With a 300km coastline that sweeps between France’s Côte d’Azur and Tuscany and takes in the Cinque Terre, the Gulf of Poets, the Gulf of Tigullio and various rivieras, it isn’t surprising that an atmosphere of old-world glamour envelopes many of the seaside towns. Away from the coast though, the Maritime Alps provide a network of mountain trails which are perfect for hiking enthusiasts. Its picture postcard villages are pretty much unrivalled. The pocket-sized villages of the Cinque Terre and Portofino are unquestionably beautiful – even if rather busy. If you prefer somewhere a little quieter, Camogli or Portovenere may be more appealing. Get ready too for some memorable views. With a backdrop of the Maritime Alps, dotted with pretty villages and swathed in terraced vineyards and olive groves, the views from the coast are every bit as good as those from the mountains. The region’s most famous culinary export is probably pesto, made from its sweet basil and prized olive oil. Here, it’s most commonly combined with trenette (similar to linguine) or trofie pasta, and in the case of the latter, often together with green beans and potato. The seafood is superb and local specialities include dishes made from baccala (dried cod) and anchovies. Other highlights include bread-based delicacies such as fugassa, a soft thick focaccia covered with onion slices and olive oil. The small town of Recco has given its name to Focaccia di Recco, a thin sheet of baked focaccia with an oozing layer of crescenza cheese in the middle. When it comes to wines, the region’s most important grape varieties are Albarola, Rossese and Pigato which match perfectly with Liguria’s traditional dishes. If you enjoy dessert wine, try to find the Cinque Terre’s Sciacchetra, produced from Ligurian Albarola, Bosco and Vermentino grapes. The region is crammed with eye-catching seaside towns and villages. 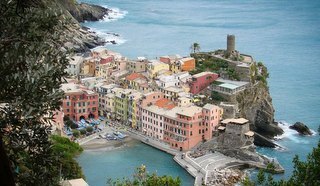 First stop for many are the villages of the World Heritage Cinque Terre – Manorola, Riomaggiore, Corniglia, Vernazza and Monterosso – but be prepared for crowds. At the equally alluring town of Portofino, little has changed since the Sixties. Stroll round the harbour at the centre of the village and look out across a bay spotted with seriously glitzy summer yachts and bobbing fishing boats. From here, you can take a relatively easy walk up to the church of San Giorgio and the 16th fortress. 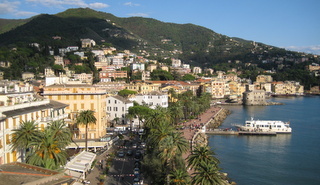 Santa Margherita Ligure is an elegant beach resort that’s a good base for exploring the coastline. Rather than travelling by road, hop on a passenger boat from here to Portofino, to the seaside town of Rapallo, San Fruttuouso Bay and Camogli. The latter is a charming fishing village which has managed to remain relatively tourist-free and is well worth a visit. 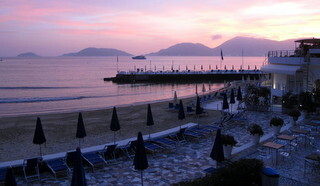 The attractive coastal town of Lerici, with its pastel-coloured houses and castle, is popular with Italians. Visit the historical quarter, amble along the waterfront promenade and pop over to Portovenere or the Cinque Terre by boat. Choose from a selection of fairly gentle walks from Lerici, to San Terenzo or the village of Tellaro. Other seaside towns worthy of note include Sestri Levante, also a favourite with Italians, and Alassio, where green-shuttered ochre houses back on to lovely sandy stretches. At Varese Ligure, summer operas are held in the Borgo Rotondo, while medieval history is still evident at Noli, Chiavari and Albenga. Last but certainly not least, Genoa takes pride of place as one of Europe’s largest medieval old towns. The birthplace of Christopher Columbus is home to ornate palazzi and exceptional churches and is also Italy’s chief port. With fabulous coastal walks and a landscape of forested mountains intersected by streams and lakes, this is a popular region for hiking. Paths are well-marked and coastal villages linked by train and boat. Explore the coast in style. Take the picturesque train ride that runs the length of the coast or the regular passenger ferries between the seaside towns. The region has appealed to literati alongside the glitterati. DH Lawrence, Ernest Hemingway, Ezra Pound, Yeats, Byron and Shelley were all attracted by the region: in fact Lerici Bay was renamed The Gulf of Poets in honour of Byron and Shelley. Before his death as a result of a boat accident, Shelley lived in San Terenzo and was buried there at Villa Magni. As in most Italian regions, August comes to life with summer celebrations and ‘feste’. In Camogli on the second Sunday of May, the smell of fried fish wafts over Piazza Colombo during the Sagra del Pesce, dedicated to San Fortunato, the patron saint of fishermen. Festival goers all get a share of the 3 tons of fresh fish fried in a giant pan with a 6m long handle. In August, Lavagna hosts the Torta dei Fieschi when the town’s six medieval quarters celebrate the marriage (in 1230) of Opizzo Fieschi, count of Lavagna, to aristocrat Bianca de’ Bianchi of Siena. Join in two days of live music, medieval games and the cutting of an enormous wedding cake. Our Parma, Tuscany and the Ligurian Sea tour ends with some free time in the charming coastal town of Lerici. You can read more about Lerici here. 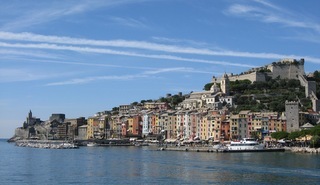 An extended stay in Liguria is a great start or end to any of our tours to Piedmont. There are three tours to choose from – the Best of the Italian Alps, the Jewels of Piedmont and our new tour for 2019, the Mountains of Piedmont. Fly to Genoa, Pisa or Nice. More information on the area from the Italian Tourist Board.